Hiring the best talent is crucial to your business success. But if your team is too small to have a dedicated HR department, you need to involve your current staff to do it. Keeping track of all candidates, collecting and organizing documents, interviewing, employment testing, background and reference checks can be organized in a visual way to give you better insight in a whole process. 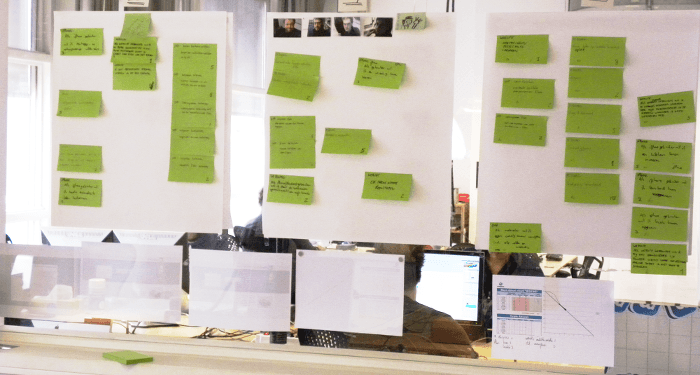 If you want to significantly improve your recruitment process and make it much less painful for team members involved in it – why not try Kanban to aid you in it? To keep track of the candidates' progress and make the process accessible and visible to everyone on the team, visualize all of the process stages on a Kanban board, and move items (cards with candidates names on them) along, as they pass through the recruitment process. - candidate backlog – candidate contact – candidate contacted – phone interview scheduled – phone interview – schedule in-house interview – in-house interview scheduled – in-house interview – candidate rejected (no interview) – candidate rejected (after interview) – candidate on hold – company director interview – candidate for offer. This way a lot of time had been saved by not needing to constantly update people on how the process is going, who passed, who's been rejected etc. Additionally, the use of a virtual Kanban board (Kanban Tool) allows to place loads of information on the card, and it will travel along the process with the card. Any comments on the candidate's skills, attached references, resume, portfolio etc – facilitates the ease of following the process by many different people at once. The company managers didn't need to oversee the process, not ask questions, which create more work for the team, whereas with Kanban all questions are answered by looking at the board. Interestingly, the team had decided on not applying any WIP limits, since talking to candidates needed to be done on a 1o1 basis anyway. And this worked just fine. What Matthew wants to underline though is a great observation, that even though the entire team is working on the process, there still needs to be a person responsible for the entire endeavour and calling the shots. Otherwise, there may be unnecessary issues. Good luck to all testing Kanban on their short-term projects!